Gotham City is under siege by a series of bizarre crimes and only the world's greatest detective, Batman, can unravel the mystery! 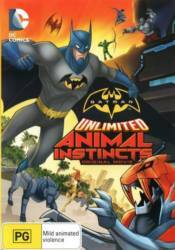 The trail leads to none other than the Penguin and his Animilitia, an animal-inspired squad of villains including Silverback, Cheetah, Killer Croc and the monstrous Man-Bat. Commanding a rabid pack of cybernetic carnivores, the Animilitia seems unstoppable, but Batman has some backup of his own as Green Arrow, The Flash, Nightwing and even Red Robin Join the fight. So get ready for a wild, snarling showdown in the concrete jungles of Gotham. It's an all-new DC Comics animated adventure that will leave you and your family roaring for more!